It's probably no surprise... I love fluffy pets. So when Bev VanZant -- aka Pet Care Bev -- asked if we'd help spread the word about her month-long drive to help Small Paws Rescue, it took about one second for us to say YES! "Small Paws Rescue brought Tyler and me together. But even before Tyler, Small Paws has been important to me. Small Paws is a courageous group of 800 volunteers and 6,000 supporting global members. 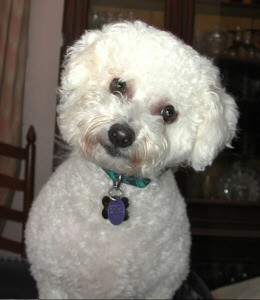 Over the past 12 years they’ve helped over 8,000 Bichons, Bichon Blends, and dogs who have had a passing affiliation with a Bichon to find forever homes. Volunteers foster dogs in their homes across the United States. Small Paws Rescue embraces the philosophy of “no-kill”–nearly all their donations go to pay vet bills. And the little fluffy dogs that Small Paws rescues usually come from horrible situations. So there’s always vet bills." Flat Tyler on the right. During the month of March, Bev is hosting a flat pet giveaway to help raise funds for Small Paws Rescue. What's a flat pet, you ask? While it's certainly no replacement for the real, fluffy thing, a flat pet has its advantages and can go places no other pet has gone before. Cosmo's been asking for a flat version ever since he saw Tyler's. In addition, Karen Nichols, the Catster blogger and the owner of Flat Skeezix, has offered to create one of her amazing, personalized mixed media pet portraits to use as a give-away during the Flat Tyler Small Paws Fundraiser! This is an incredible prize worth $100.00! The pet portrait will be given away at the end of March. How to help the fluffy dogs? 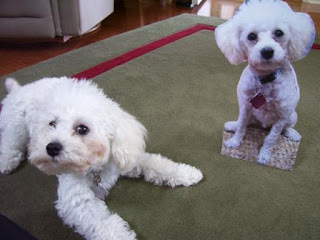 Every $5 donation earns the chance to win a flat pet and every $15 a chance to win the portrait. All the details on how to enter and donate are here. And remember, all the donations go to the fluffiest of causes, to help the sweet fluffers at Small Paws Rescue. If you can spare any pawket change, Bev and Tyler (both Flat and Fluffy) will thank you furever!